It’s amazing how invigorating it can be to get out of the office to learn and network with other communications professionals. 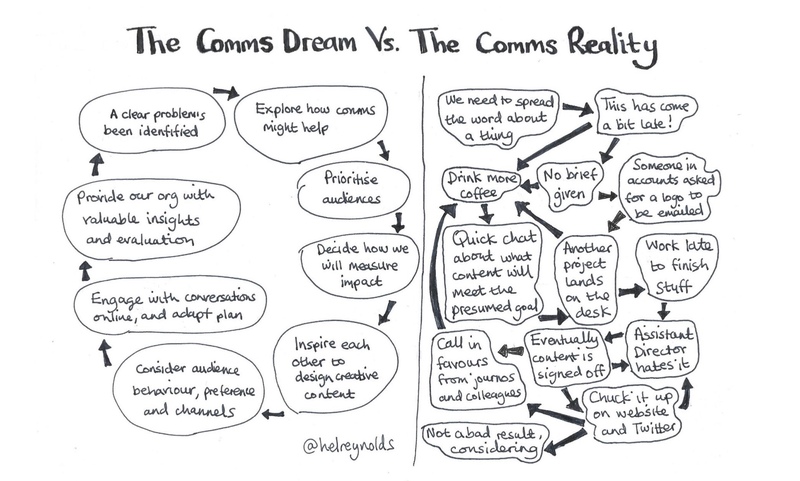 Yesterday I loved hosting the NHS Confederation’s Communications Conference 2018, and I’m so grateful to share some excellent insights into comms and life, from a delegate at the event, Katie Stephenson. It was great to meet Katie, who is Head of Communications and Marketing at Advancing Quality Alliance (AQuA), and I’m going to hand over to her for her thoughts. “Yesterday I attended the 2nd annual Communications Conference for NHS communication professionals and practitioners held in Manchester. The theme was future-proofing communications in the modern NHS and we heard from fantastic speakers including Kate Dale from the This Girl Can campaign, Ceri and Melissa from NHS Blood and Transplant and CIPR President Sarah Hall as well as great panel discussions on digital in the NHS and crisis communications. There were also some really great masterclass sessions and I attended one with Helen Reynolds about all the things you want to know about comms but are afraid to ask and one with the team from West Yorkshire and Harrogate Health and Care Partnership about effective engagement and communication with STPs and other groups . Throughout the day I picked up so many tips and ideas (and goodies from the generous sponsors….the sleep balm will definitely come in handy!). Some of what resonated with me was either things I’d not thought of before or just simple things that I needed to remind myself of. Remember it’s about what the audience wants – not those who pay the bill. Use audience insight to drive your choices. Make sure that as a comms person you take time to tell people what you’ve done. Have key examples of the benefits and value that comms can bring to hand that you can whip out an any given opportunity. If the solution to a problem ISN’T digital then that’s fine too! Sometimes classic channels work just as well. There is NO solution that will fit everyone – if one channel reaches a portion of your audience, there are others which will reach the remainder – be creative! Simplify complex messages and make them meaningful for the audience. Think about what matters to them, not what you want to tell them. Don’t ask leaders what information you can share; ask if there’s a reason that you can’t share it! Ask to be part of the decision making table. How can you communicate if you don’t know what’s important to your leaders? Put glasses on a string to help prevent losing them a 3rd time in 1 day! My Irregular Choice shoes shouldn’t be kept in the wardrobe for rare occasions, they should be worn all the times a la Helen Reynolds! Thanks again to the amazing team at NHS Confederation that put together the conference. It’s important that communications professionals have these opportunities as there is so much learning from others to be had. I only wish we could have had more time with the speakers to ask a million more questions! For comms advice and inspiration straight into your inbox. As one of the team who organised yesterday’s event, it’s fantastic to hear that it was so well received. We also wish we’d had more Q&A time with speakers but we had so much to cram in! Thanks so much for coming and keep in touch with us via our monthly comms bulletin: http://www.nhsemployers.org/bulletins. Next The Comms Creative: fancy some inbox inspiration?